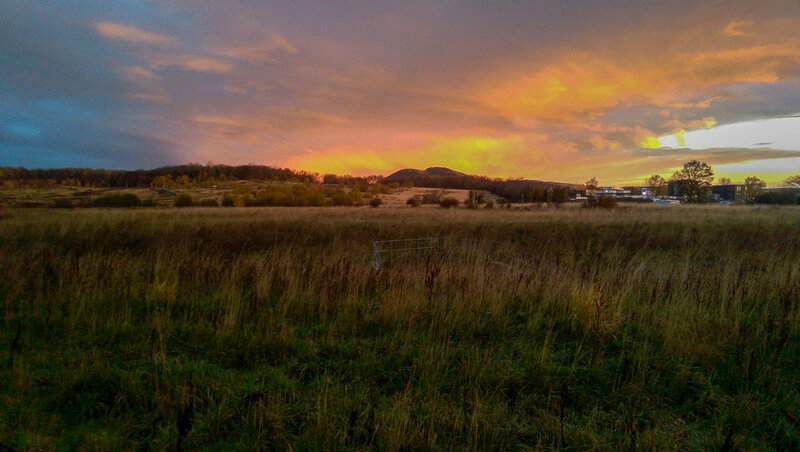 Our six days in Edinburgh we decided to do half city exploration and half “catch up on the blog” work days. The city is filled with fantastic coffee shops perfect for working on your computer or studying. I won’t bore you with a detailed explanation of our work days, save for one story. We had been working for most of the day in the coffee shop and left to grab some dinner. We decided to walk about a mile to a place where I thought we could grab a quick bite. Well, we arrived at the cafe, sat down, the waitress came over and poured us some water, gave us the menus and walked away. She came back a short while later, and just when we were about to order she mentioned the gas wasn’t working, so we couldn’t order anything hot—essentially we could either have salad or cake. We decided we wanted something warm as it was cold outside, so we left. We walked about 10 minutes more to my second choice and had a fantastic meal followed by a great dessert. Bryan then reached for his reusable toothpick that he keeps on his keychain and had the realization that his keychain was missing—which had the keys to our AirBnb! After thinking for a moment Bryan remembered his keys were most likely at the coffee shop on the couch we had worked on. They must have fallen out of his pocket when he stood up to leave. Quickly we paid the bill and asked to use the restaurant’s phone to call the coffee house. No answer. We called two more times. Nothing. I hooked up to the restaurant’s WiFi to find the coffee shop’s website and looked up their opening hours, only to find it closed 10 minutes ago. We RAN in our winter jackets and full backpacks about 1.5 miles back to the coffee house with very full stomachs. I thought I was going to vomit, and cramps from running on a full stomach quickly overtook me, but we kept on running, pushing around people and gathering quite a few confused looks until we arrived at the coffee shop. You have NO idea how relieved we were to find employees inside cleaning up after closing. We knocked on the glass door and explained our situation. The employee let us in to have a look. Sure enough, Bryan found his keys at the couch. We sighed and laughed, so relieved we had the keys! And we still made it on time to the fireworks show. When researching what to do in Edinburgh, the first thing I booked was the Harry Potter Walking Tour through AirBnb Experiences. The one we went on was fantastic—our guide, Rachel, was very knowledgeable and clearly a Harry Potter fan herself, not to mention all profits went to Child.org, a charity that does various programs aimed at bringing children and their families out of poverty. Most people think of London when they think of Harry Potter because of the movies, but Edinburgh was where JK Rowling actually lived while writing the first few books of the Harry Potter series. 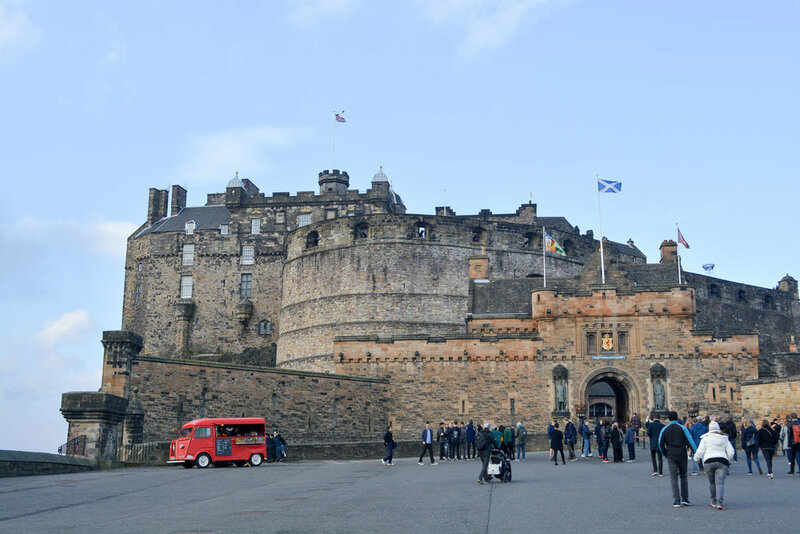 Many places around Ediburgh actually inspired the places in Harry Potter. Along the tour we saw the inspiration for Knockturn Alley, Hogwarts, Diagon Alley, various character names, and even some cafes and the hotel where she wrote her book. In addition, we learned a bit about Edinburgh’s history. We had a stop on Victoria street (the inspiration for Diagon Alley), where we had a chance to go into the Museum of Context, where official HP products are sold, but also some unique products made only for the store. JK Rowling’s handprints. The guide said her hands were tiny. When I put my hands inside of hers to compare Bryan laughed hysterically because mine were even smaller. Working hard at Hogwarts. Do you like my owl? Victoria Street, the inspiration for Diagon Alley! We visited Greyfriar’s Kirk during our Harry Potter tour. It’s the graveyard where JK Rowling drew inspiration from for her character names. It also offers a great view of the city. It’s also famous for its loyal canine resident, Greyfriars Bobby. Greyfriars Bobby was a Skye Terrier who lived in the 18th century. He was the pup of local nightwatchman, John Gray. 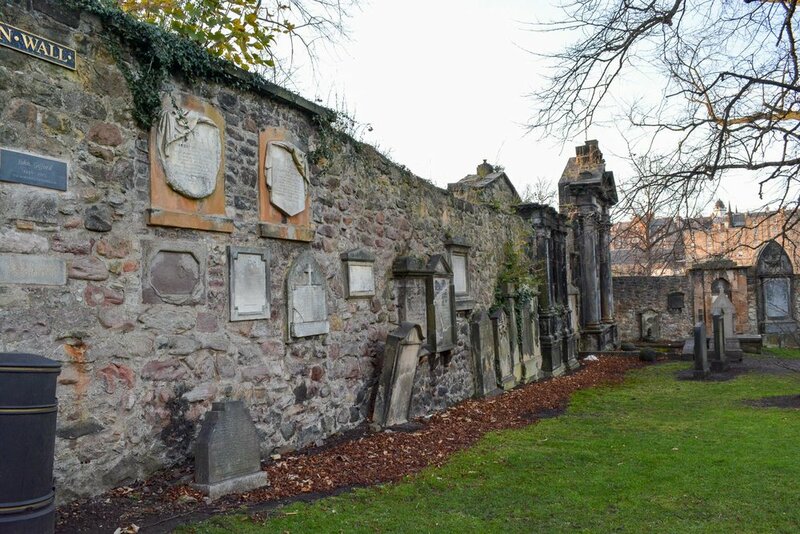 When John Gray died, his body was buried in Greyfriars Kirkyard, and for the next 14 years, the pup guarded his dead owner’s gravestone. He became known locally for his undying loyalty and was also buried inside Greyfriars Kirkyard not far from his owner. You can visit his grave and the statue that commemorates him just outside of the graveyard. Remember the story I told you at the beginning about losing our keys? Well it happened on Guy Fawkes night, the 5th of November. We were told about Guy Fawkes Night by our AirBnb host, who called it Bonfire Night because most people build bonfires to celebrate. e also said the city set off fireworks and Calton Hill would be a good place to view them. So what is Guy Fawkes Night? It all started in 1605 when King James I ruled over England, and was gasp a Protestant! A group of Catholics decided to plot against the King and assassinate and replace him with a Catholic head of state. The plot was to blow up the House of Lords during the State Opening of Parliament on November 5. However, the night before, authorities were tipped off about this plan through an anonymous letter. They found Guy Fawkes guarding 36 barrels of gunpowder. He was arrested and the King lived. The next day, November 5th, the king’s Council allowed the public to celebrate the king’s survival by building bonfires around the city, so long as they were without danger or disorder. Guy Fawkes’ failure is still celebrate today. We climbed up to Calton Hill and found it was a great viewpoint to see the city’s fireworks and also the city. On top of this hill you will find the city’s collective contemporary art gallery and a smaller duplicate of Athens’ Acropolis! Edinburgh Castle is probably the most touristy thing you can do, but Bryan and I still enjoyed it very much! We booked ahead online for a timed entry. Each ticket includes a free 20-minute tour of the outside of the castle. 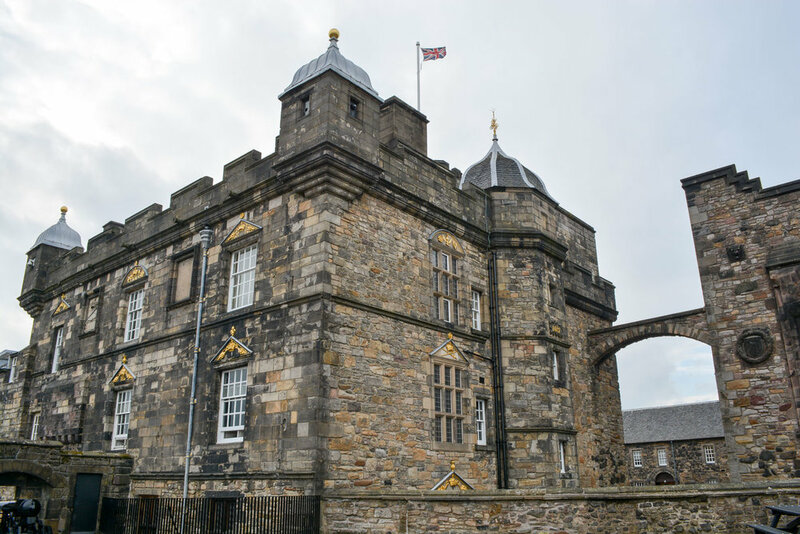 I would recommend you do this tour as you get an overview of all the exhibits and museums within the castle. After the tour, Bryan and I decided which buildings we wanted to spend time in. Scottish National War Memorial—This building at first glance looks like a cathedral but is in fact a war memorial honoring Scots who have died in combat since World War I. It is a very moving exhibit, and we recommend you visit. The Royal Palace—I really found it interesting to learn about Mary Queen of Scots and see her apartment. You also get a chance to see the Crown Jewels and the Stone of Destiny! St. Margaret’s Chapel—The oldest building in Edinburgh, it was built in 1130. This chapel is very small, but apparently you can get married there if you don’t mind having a very small wedding. Mons Meg—A cannon built in 1457, it was the cutting edge of technology at the time. 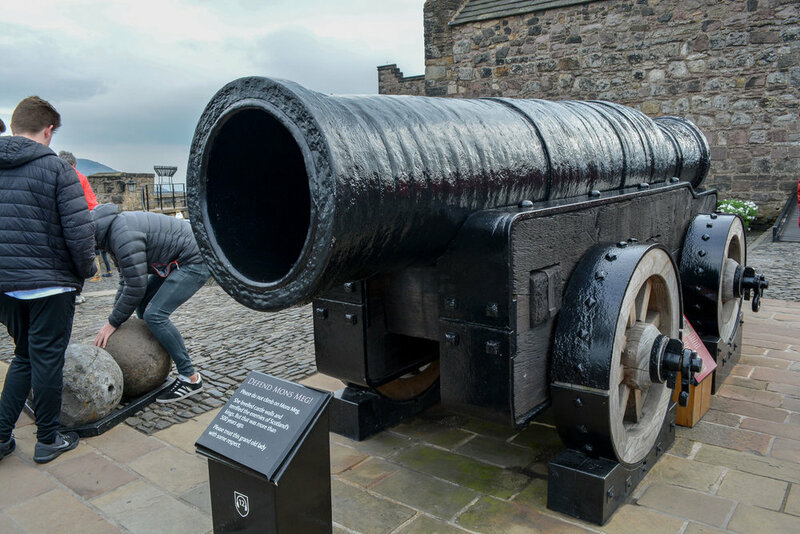 The cannon could shoot a 330 lb ball about 2.3 miles! 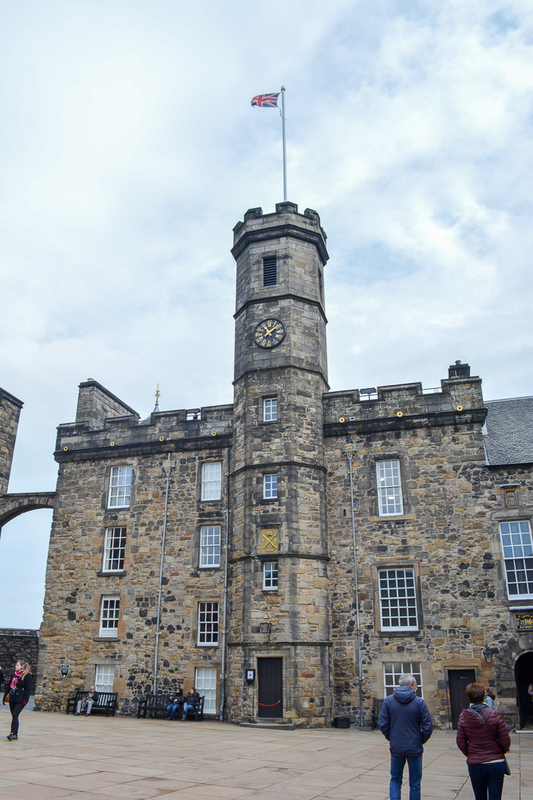 Prisons of War—Learn about prison life in Edinburgh’s prison, which has artifacts made by prisoners at various times in history, including prisoners from the American Revolutionary War. After finding out that Edinburgh Castle was built on top of an old volcano, Bryan and I went on a hunt for some information on Scotland’s volcanic history. We turned to the National Museum of Scotland where we found some really interesting information on Scotland’s geology. The other history we were hoping to read about were the clans. While the museum had decent information on William Wallace and Robert Bruce, there was almost no information on the clans and how Scotland was divided up and ruled by various clans before it became unified to fight for independence. The Museum itself has impressive architecture and some great exhibits. 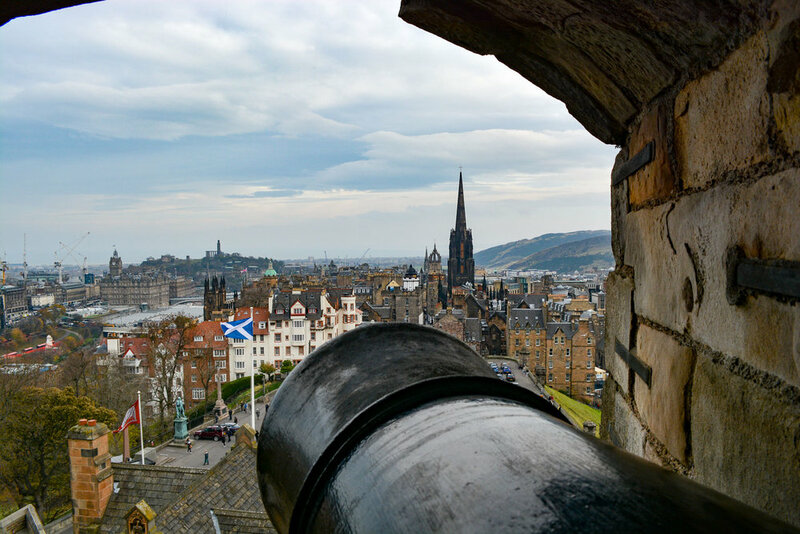 The first thing we noticed when walking into Old Town is the 200.5-foot Gothic tower along Edinburgh’s Old Town skyline. This tower is a monument to Scottish writer Sir Walter Scott. You can actually climb the winding staircase to the top for some panoramic city views. 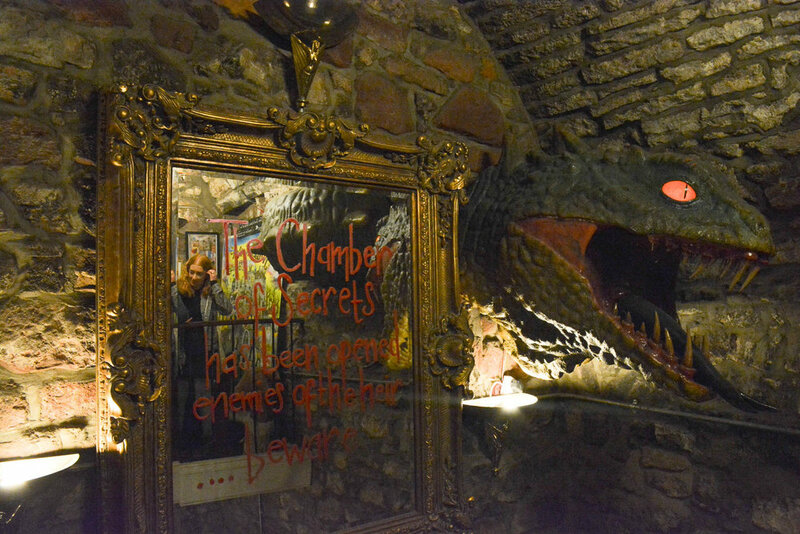 We also discovered this part of Edinburgh during our Harry Potter tour, but I thought it was worth mentioning here, as we loved it! It explores Scotland’s 3 most famous authors, Sir Walter Scott, Robert Burns, and Robert Louis Stevenson, who wrote Treasure Island. The museum is free to visit and also has temporary exhibits throughout the year. I loved the quotes on the sidewalk outside the museum. Early one morning I decided to take a walk in the park by our AirBnb. I found myself by Craigmillar Castle, Edinburgh’s ‘other castle.’ We didn’t get a chance to go inside, but I did walk around the surrounding park and loved the open green spaces and forested sections that you could walk through. Mary Queen of Scots used this castle as a safe haven back in 1566. Apparently, this castle is one of the most preserved in Scotland, so you can actually walk through it and see all the rooms. It is a maze of rooms though, as it was originally built as a simple tower house in the 1300s, but each owner of the years expanded it into a castle with a complex layout with many nooks and crannies to explore. Fun fact: Scotland’s national animal is the unicorn! Seen here on the emblem with England’s lion, the unicorn is in chains—a sign of England overtaking Scotland? Hey—we had to get a telephone booth picture! Paradise Palms (aka Lucky Pig) — Located by Edinburgh University, the tikki bar vibe inside this restaurant and bar is so much fun. They had plenty of vegan options which are clearly marked on their menu. We enjoyed the Chilli Bowl and the Jerk Jackfruit Dirty Fries! The Chipotle Mac was okay, but the portion size was tiny. NovaPizza Vegetarian Kitchen— A cozy Italian restaurant with a romantic vibe, we loved our meal here. All their pizzas and pastas are able to be made vegan. We ordered the 4 Stagioni Pizza and the Pasta Carbonara. Despite the large portions, we ate every. last. bite. Kalpna— One thing Bryan and I have enjoyed about traveling to different countries is trying their international specialties, and you can’t visit the UK without having some delicious Indian food. Kalpna is a staple in Edinburgh that is an all vegetarian Indian restaurant. We split a Vegan Thaali Raj Bhog, so we could sample a large variety of their dishes. It was a fantastic experience—we recommend making reservations ahead of time though, it’s very popular! Harmonium— I can only vouch for the breakfast, but their menus for lunch and dinner also look delicious. We were craving a traditional Scottish breakfast, and this vegan restaurant offers one, which hit the spot! They also have it in two different sizes, depending on how hungry you are! A small vegan Scottish Breakfast: veg. haggis, baked beans, scrambled tofu, veg. bacon, veg. sausage, toast, veg. black pudding, and a tattie scone! Hendersons— With a few different locations, this chain is well known to vegetarians and vegans in Edinburgh. Vegan options are clearly marked on their menu. Holy Cow— This restaurant was experiencing some issues when we visited, but their menu looked delicious and healthy. What I had really wanted to try though was their vegan desserts! They had them on display, and they looked absolutely delectable! The Piemaker — While in the UK, you have to try savory pie! This place was one my “must visit” place, but when we were there they had JUST closed for a two-week renovation of their restaurant. They have sweet pies too, and the vegan pies are clearly marked on the menu. Beetroot Sauvage — This vegan restaurant is newer in Edinburgh, but it already has quite a following and rave reviews. We did not have a chance to make it here, but I did check out the menu and have been eyeing their cheese platter! Brew Lab— If you don’t know, Bryan and I are pour-over filter coffee fans. We became SO TIRED of only finding espresso drinks served at coffee houses that we began to search out places that served pour-over filter coffee. Brew Lab is one such place. And they take great pride in their brewing—they have it down to a science—hence the name. We spent 2 of our work days in this busy coffee house. They also had vegan options for lunch and snacks. Black Medicine Co— This coffee house has been around for 20 years, and with 2 spacious levels of tables it’s a popular place for people meeting to chat and people working. We enjoyed our coffee here, but the atmosphere was perfect for working too! They also had a vegan soup and sandwich which was perfect for lunch!